Bruce Rauner (R.), Illinois’ newly elected governor, signed an executive order ending mandatory public sector union dues on Monday. As a result of Rauner’s action, public sector workers will no longer be forced to join government unions, such as the politically powerful American Federation of State, County and Municipal Employees (AFSCME) and Service Employees International Union (SEIU), as a condition of employment. "An employee who is forced to pay unfair share dues is being forced to fund political activity with which they disagree. That is a clear violation of First Amendment rights—and something that, as governor, I am duty-bound to correct," Rauner said in a press release. The judiciary has dealt setbacks to Illinois’ mandatory dues policies in recent years. Rod Blagojevich, the state's imprisoned former governor, signed an executive order in 2003 forcing home healthcare workers, many of whom were caring for disabled relatives, to pay union dues. Public sector unions, who were among the top contributors to Blagojevich’s campaign, added millions to their coffers as a result of the order. The Supreme Court struck down Blagojevich’s forced dues scheme as unconstitutional in 2014. The court’s 5-4 ruling in Harris v. Quinn only applied to Illinois, but several other states have since reformed the way that unions collect dues from home healthcare workers in the aftermath of the ruling. "Forced union dues are a critical cog in the corrupt bargain that is crushing taxpayers. 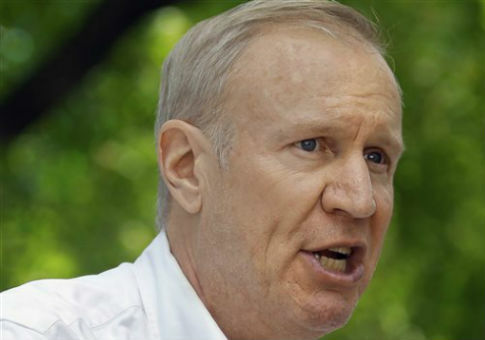 Government union bargaining and government union political activity are inexorably linked," Rauner said in the release. Pamela Harris, the one of the plaintiffs in Harris v. Quinn, praised Rauner for ending the symbiotic relationship between public sector unions and government. "During the 5 years that Harris v Quinn was pending, I came to see the damaging relationship between the public sector unions and our elected officials. The public unions’ insatiable need for money and politicians’ coffers filled with union dues created instability and havoc in Illinois," she said in a statement. "Governor Rauner has taken steps today to return accountability to us, the taxpayers of Illinois." A study from the Illinois Policy Institute, a free market think tank, found that 86 percent of all state officeholders in Illinois received campaign contributions from public sector unions. Public sector unions decried the executive order. "It is crystal clear by this action that the governor’s supposed concern for balancing the state budget is a paper-thin excuse that can’t hide his real agenda: Silencing working people and their unions who stand up for the middle class," AFSCME’s Illinois chapter said in a blog post. Kristina Rasmussen, a spokeswoman for the Illinois Policy Institute, said that mandatory union membership does more to silence workers than optional membership. The executive order does not affect any worker who wishes to remain in the union. Rauner’s reform will protect workers who may have otherwise been too intimidated to resist local union bosses, Rasmussen said. "I think the First Amendment protects people from being railroaded into an inherently political organization," she said. "If you want to be a full member, that’s fine, that’s the workers choice. But you don’t give up the workers’ right to speech when become state employee." Rauner is prepared to defend the executive order in court. He is petitioning federal courts to weigh in on forced dues collection. The state will direct potential union dues into an escrow account while courts examine the issue. If the decision is upheld, that money will end up in the pockets of workers; if he is unsuccessful, it will go to union coffers. Worker choice groups are using the Harris precedent to challenge automatic dues collection across the nation. Rebecca Friedrichs, a public school teacher in California, petitioned the Supreme Court in January to hear her case challenging all forced dues scheme as a violation of the First Amendment. "Each year, the State of California compels its public school teachers to make hundreds of millions of dollars in payments to Respondent California Teachers Association (‘CTA’), Respondent National Education Association (‘NEA’), and their local affiliates. California law makes these payments mandatory for every teacher working in an agency-shop school—which is virtually every teacher—regardless of whether that teacher opposes the positions CTA takes in collective bargaining and regardless of whether the positions CTA takes in collective bargaining are directly contrary to that teacher’s on-the-job interests," Friedrichs’ brief says. "This multi-hundred-million-dollar regime of compelled political speech is irreconcilable with this Court’s recent recognition of ‘the critical First Amendment rights at stake’ in such arrangements." Rauner’s executive order will end exactly that kind of arrangement, according to Patrick Semmens of the National Right to Work Foundation. "This executive action is a bold step to protect the rights of Illinois state employees from being forced to pay tribute to union bosses as a condition of working as a public servant. We look forward to providing legal assistance to Illinois employees who want to exercise their rights under this executive order," he said in a statement. This entry was posted in Issues and tagged Illinois, Right to Work, Rod Blagojevich, Unions. Bookmark the permalink.